When the puppet comes to life, it's Geppetto's dream come true. Except Pinocchio turns out to be not such a nice boy after all. Pinocchio enjoys nothing better than creating mischief and playing mean tricks. As he discovers, being bad is much more fun than being good. Happily for Pinocchio, he will learn that there is much more to being a real boy than having fun. A magical tale that has entertained children of all ages for more than a hundred years, this lavishly and gorgeously illustrated new edition is the perfect introduction of a timeless classic to a new generation of readers. Carlo Collodi is the pen name of Carlo Lorenzini. Born in 1826, he worked as a journalist before publishing The Adventures of Pinocchio in 1883. 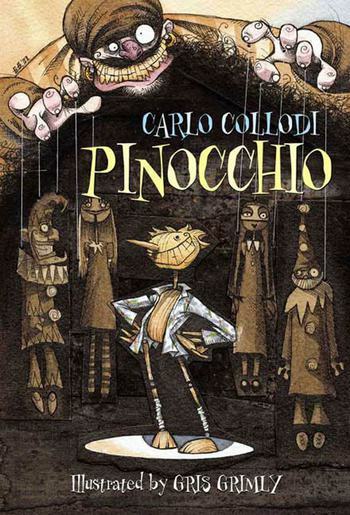 Translated into more than ninety languages, Pinocchio has never been out of print. Gris Grimly is the illustrator of many books for young readers, including The Cockatrice Boy by Joan Aiken and A Collection of Edgar Allan Poe. He lives in Los Angeles.